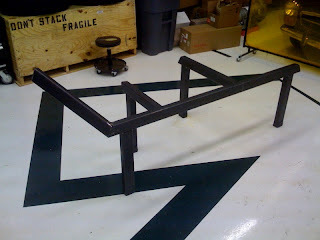 So the last few days have marked the first days at Local Motors of putting "fire to steel," or in another word, welding. As mentioned, we're quickly outgrowing the utility of the foam mockup in terms of fitting components and checking the feel of certain components based on where they're located in the CAD model, since "feel" is the one thing you can't get from the computer. To accomplish this, we needed to make a rigid structure that we can quickly and accurately modify when we feel that something needs to move after testing its location. The pictures below are the early stages of that fixture, and will soon include the pedals, the seat, the steering column and a host of other components that we will continue to layer on as we check the interface between the Rally Fighter and its passengers. 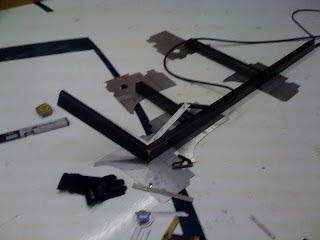 The very beginnings of the fixture - main rails placed on the floor and tack welded together. 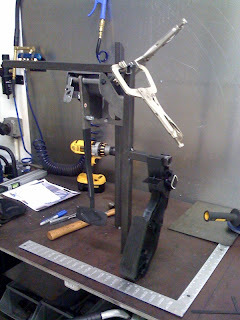 The components from the picture above now with the legs welded on to set the floor position at ride height. As I mentioned in a previous post, we've been working on placement of the accelerator and brake pedals. Below is a photo of the pedal fixture now placed inside the foam mockup to check the placement with a driver in position, and to see how they fit relative to the engine and transmission tunnel. You will also notice that the steering column is now in place as well to make sure that the relationship between the pedals, the column and the driver position as dictated by the digital model are correct. So far, everything is a go, but there is still work to be done on the flooring, the roll cage, the footwells, and the transmission tunnel so I can't say the pedal position is locked down just yet. To accomplish these things, the foam model will quickly need to be replaced with a more rigid and adaptable fixture for more accurate and dynamic measurements, which I will update you on soon. 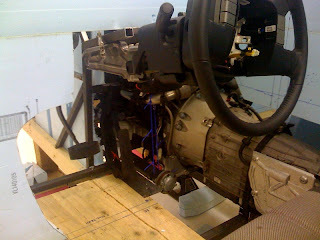 As promised in a previous post, we are placing the accelerator and brake pedals in the Rally Fighter to determine their location in regards to driver comfort, spacing around the engine, relationship to the floor design as well as that of the firewall and possibility of integration to the mounting brackets for the steering column. As mentioned in said post, this work is being done in the digital realm by reverse engineering the pedals and placing them in the 3D vehicle model. However, one thing that you simply don't get (even when you've placed a 95% male model into the driver's seat) is "feel" for pedal location. This is where testing/mockup needs to be done in the physical sense. Of course, this will be supported by the initial data in the computer model, but the final determination will be based on a gut check on how the pedals actually feel based on the computer models. 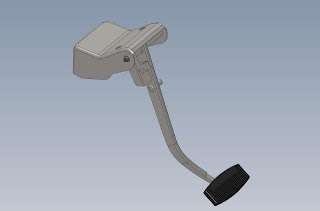 Therefore, we are in the process of creating a fixture that will allow us to place the pedals in our mockup and adjust as necessary, then update the 3D model. Some of the bracketry, tubing etc. may even be directly integrated into the chassis design if we like the relationship between the driver location, the pedal position and the placement of the steering column. Now that our E320 has been sent off for reverse engineering of the engine management system in an effort to pull out the ancillary systems to just running the engine (anti-theft, window controls etc. ), a critical part of fitting the new system into the Rally Fighter will be identifying which Benz components will stay, and those that will have to be added. One thing that will more than likely need to stay is the computer. 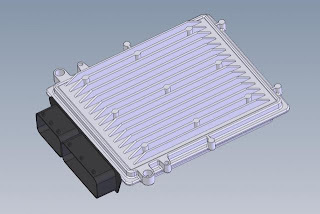 Therefore just like with the pedal assemblies from my last post, it was required to draw the computer and enter it into the 3D model for packaging. Later, it will be paired up with the remaining wiring once the system has been stripped down to the minimum equipment required to run the engine. A critical part of determining the final body shape is the suspension geometry and making sure that everything will fit under the wheel wells both at ride height and at full compression. 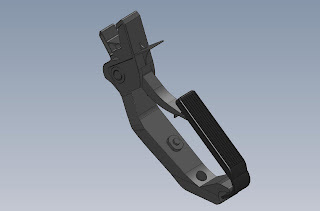 As I've mentioned, we will be simulating the suspension travel in our model and already have with a mockup suspension, but now that we have the actual components that we will use in the Rally Fighter, I have been drawing/scanning them and getting them ready for the model and the simulation. 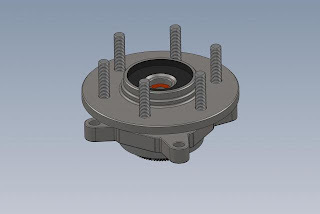 The image below is the wheel bearing/hub assembly which was drawn from measuring the actual part and it will be mated to the spindle, which was scanned then entered into solidworks due to its more complex geometry. ...and hit the brake too, although I'd much prefer to be on the gas! Dave and I have been super busy in the development of the Rally Fighter, particularly on the necessary CAD work required to get both the chassis and the body to a stage where we can begin tooling development. While Dave has been focusing most of his efforts on the suspension (more on that to come) I've been continuing with scanning and drawing various components that we will be integrating into the chassis and body development. One of the first steps towards tooling for both the chassis and the body (more so the body in this case) is to set the H Point (the Hip Point of the driver). Before determining the final H Point a lot of things have to be considered: head room, visibility, how the driver will be affected in a crash at certain positions, driver position relative to the steering wheel, driver comfort, and Heel Point. In relation to the latter two, it was necessary for us to determine where the pedals will be located, so I had to draw them and then put them in the model along with the 95% male model already placed in the model. The final positioning not only relies on the relationship with the driver, but with the firewall, the engine, and the flooring. It has a great deal of influence on how each of these is placed, so each of these things has to be carefully weighed before determining the final location for the pedals. Below you will see the images of the pedals (the final positioning and discussion on how that determination was made is soon to follow).